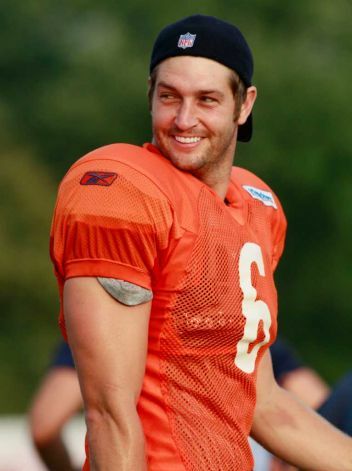 I don’t know about you, but if I were Jay Cutler, I’d be Hopping Mad! It’s ironic the first three letters of OFFensive Line are OFF. I was under the impression our Bye Week was October 30th? 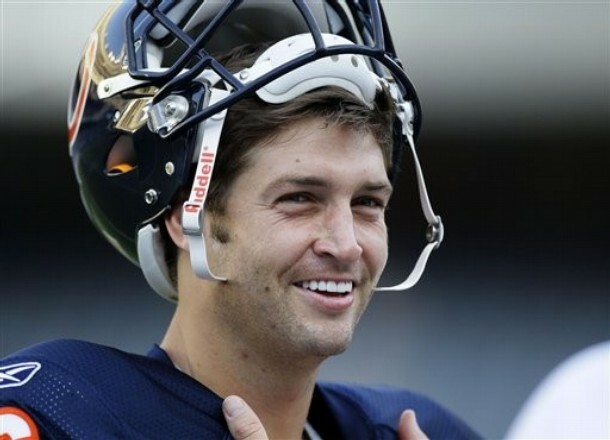 Jay Cutler showed up to play football, while the OL were nowhere to be seen. Brian Urlacher, Matt Forte and Lance Briggs, showed up to play. The OL, did not. Perhaps I should send them all a copy of the movie, The Blind Side? Mr. Davis, Mr. Webb and Mr. Omiyale may I introduce your to Mr. Oher (and Sandra Bullock)? 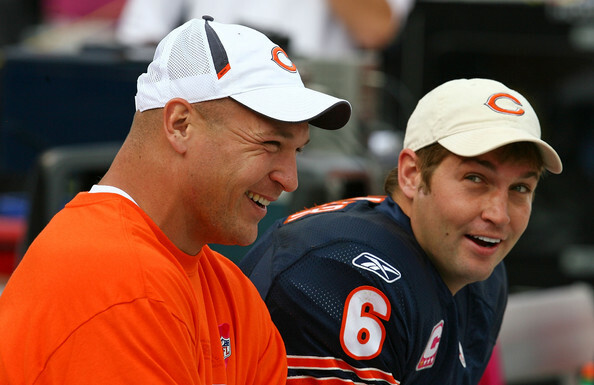 Jay Cutler was Sacked 5 Times. Make that 6 times. 3 in the last few minutes. Ugh! He was Rushed, Hurried, Knocked into, Pressured, Mocked and Harassed more times than I can count (or find the accurate numbers on Google). The OL needs work, lots and lots of work. 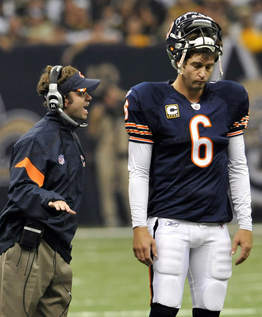 And No, Jay Cutler was Not perfect. He threw passes when he shouldn’t, to areas in which were poor choices, but he was rushed basically 90% of the time. No one protected him. 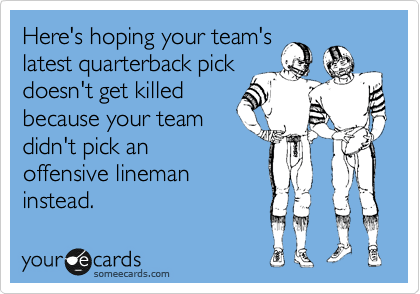 And, as I have taken a more tough approach on our illustrious QB in recent weeks (you are welcome, Phyllis), I will also be the first to jump to his defense…I mean, someone has to, as it appears the Offensive Line won’t (or at least, did Not today). These are some of my friend’s comments, lifted from Facebook.. 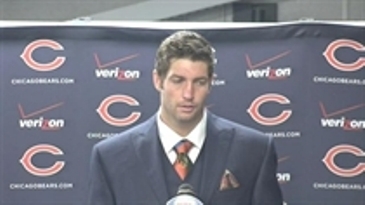 The game was not pretty…However…Jay Cutler certainly was, in his post game interview…Not only did he wear a Suit, but he was smiling. Golly…where did I hear That recommendation before? And, again, he was Smiling! (no Jack, that was not him Wincing in Pain). And he acted like a gentleman, taking responsibility for his fumble, and Not placing blame on anyone else (as I may have done in this blog). 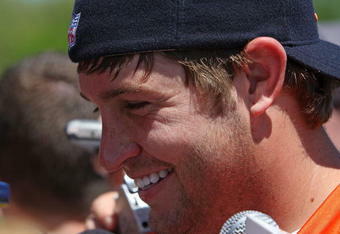 And after all that, Jay Cutler said only this, “It was a long day out there,” Cutler said. “I had to throw a lot of balls before I wanted to. 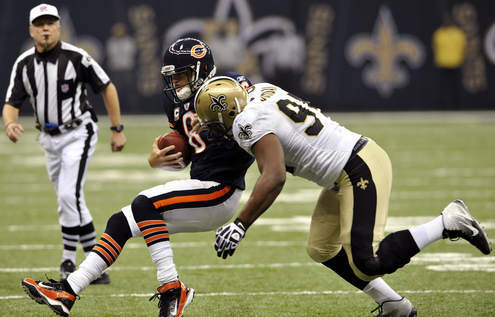 … The Saints were the better team today. They rushed me hard and forced our offense to do things we didn’t want to do.” Spoken like a true Team Leader. Well Done Jay! So…Bears Fans…Onto next week, for “America’s Game of the Week” (According to NBC), Bears v Greenbay! Put this game behind you, and Sack the Pack! I will be there, with Patrick (though back in my seats, not the sweet seats of Opening Day), cheering them on! Next Waiting outside in line to buy a Horizontal Striped Sweater? Or a Year of Chick Fil A? Well said. Love all Jay’s smiling pictures. The suit looked smashing. The sun will come up tomorrow (or Sunday) Jay! Didn’t your friend Kristin read the blog on swearing? Two steps forward, one step back, sigh….you’ll get us all in line soon enough Terry. Have a great week. I truly think the suit makes All the difference in the world! Even Troy Aikman said…’this is a mess’. 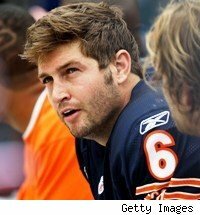 Not being a Jay Cutler fan, even I felt badly for him.